Brighten your day with a colourful, protein-filled salad! Our Triple Beetroot Salad showcases our delicious Beetroot Wedges and Beetroot & Bean Burgers in three different ways and explores the versatility of the phenomenal ingredient. Top with your favourite seeds and salad dressing of choice for a midday meal that will hit the spot! 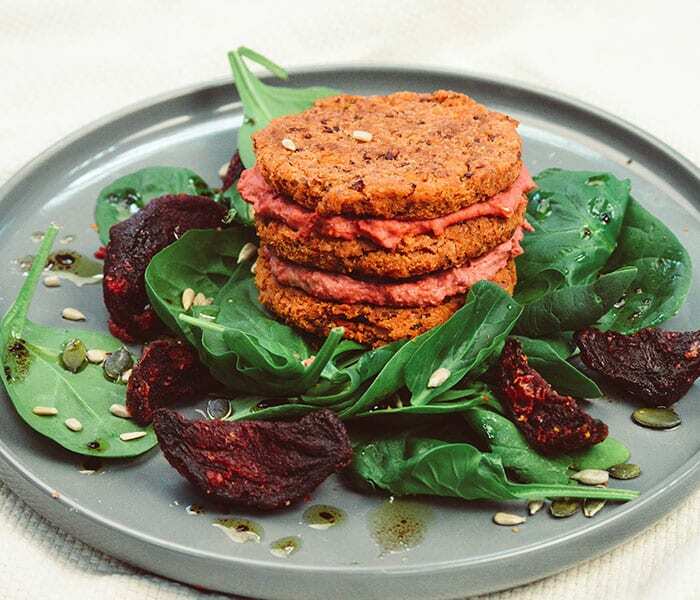 Place the Roasted Beetroot Wedges and Beetroot & Bean Burgers on a baking tray. Cook as per instructions on the pack. If you would like to make your own hummus please refer to Hummus Trio recipe. Place salad leaves on a plate adding the beetroot wedges. Sandwich the two burgers together with a generous layer of beetroot hummus. Drizzle the salad with your dressing of choice (we used a mixture of olive oil and balsamic vinegar) and scatter with mixed seeds.